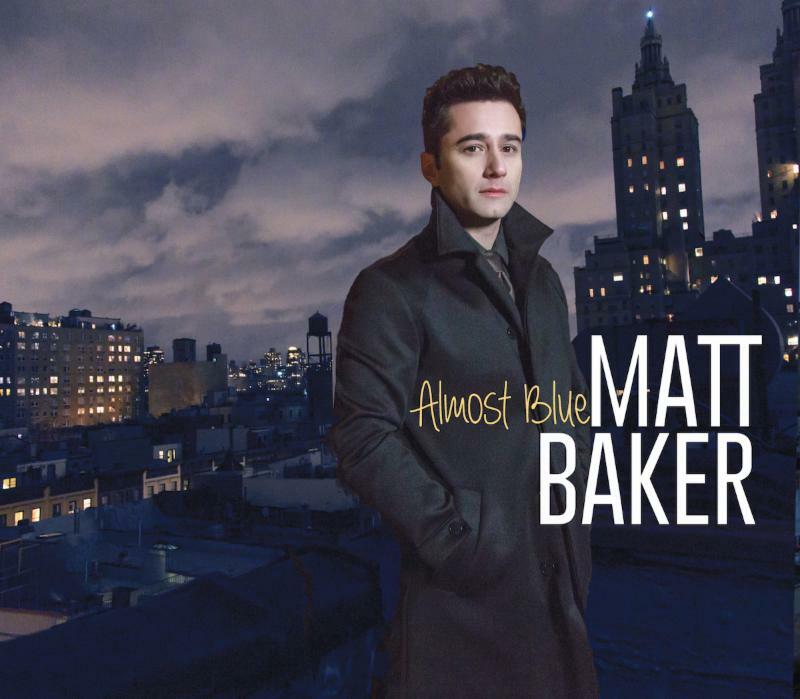 Pianist Matt Baker's new recording, Almost Blue, is his fifth as a leader and second since 2010 when he moved to New York City from Sydney, Australia. Baker abandoned a comfortable career to position himself in the pool of big fish who leave an international array of smaller ponds to test their mettle in the jazz capital. That it was a wise decision is evident: Baker--well-known in Australia and Europe during the '00s for an approach deeply informed by Oscar Peterson, his idol and first influence in matters of intention, execution and time feel--interacts seamlessly with young New York A-listers Luques Curtis on bass and Obed Calvaire on drums, placing his exhaustive knowledge of chords and scales and stylistic dialects at the service of swinging melody without letting you see him sweat. Master guitarist Lage Lund augments the unit on six selections, while formidable tenor saxophonist Joel Frahm projects his singular instrumental voice on three. The intersection of Baker's musical and personal journeys in New York is the subject of the 14-tune program, which Baker and eminent producer Matt Pierson culled from the Great American and late 20th Century Pop Songbooks. "I chose these songs because of the lyrics," Baker says. "Each one represents a certain place in my life during the period that led up to the recording. They convey the album's narrative, and have equal weight as pieces in the story." Speaking of narrative, Baker sings on three selections, presenting his vulnerable emotionally connected voice. "I've been singing for 20 years, and singing will always be there, but playing the piano is strongest in my heart," says Baker, whose latest encomium is Back Stage magazine's 2016 Ira Eaker Special Achievement Award, given to "an outstanding performer on the rise." In 2016, a worldwide audience can witness the fruits of Baker's New York R&D as he supports Almost Blue with a new trio, including Ahmad Jamal alumnus James Cammack on bass, and the crackling young drummer Darrian Douglas. "Since coming here, I feel I've begun to play with the band as opposed to having them accompany me," Baker says. "I feel that Darrian, James and I are creating whatever it is we do-various meters and rhythmic complexities, harmonic development, textural development--in the moment together." The son of a jazz trombone player with a good record collection, Baker started jazz lessons at 12, and at 15-years-old he took a once-a-week gig "at a café close to my school that had a piano," which he retained until his twenties. During his final year at Sydney Conservatory, he spent several months in New York, where he encountered and took lessons from such piano heroes as James Williams, Benny Green and Jacky Terrasson. "Friends in Sydney were forcefully telling me I had to get to New York," Baker recalls. "I started to realize what I didn't know and what I had to learn, and I felt pressure--in a good way--to up my game and not get comfortable." Baker recorded Talkin' Soul Food a week after returning to Sydney from another trip to New York, taken with the express intent of hearing every set by Peterson during a week-long engagement at the Blue Note. During that week Peterson befriended the intense, well-mannered youngster, and he remained Baker's friend and mentor for the remainder of his life, a fact that Baker honors with a still ongoing program devoted to Peterson's original music. On the strength of that recording, Baker brought his trio to the 2003 Montreux Jazz Festival to serve as house band for its entire 2½-week duration. Festival founder and artistic director, the late Claude Nobs brought the trio back the next year, and had Baker play solo piano for the 2005 and 2006 editions. Baker represented his Swiss experience--which gave him an opportunity to meet and pick the brains of an international array of jazz celebrities, such as Herbie Hancock and Michel Camilo--with the 2006 trio and chamber orchestra album From An Afternoon With the Mountains. With a year's savings as a cushion, Baker spent his first year in New York networking at such jam session hubs as Smalls, Fat Cat, Cleopatra's Needle, and Smoke, where he "hung out, listened, gave out the business card, and had stacks of people not call me," while also studying with pianist Taylor Eigsti, whom he met on a 2009 New York visit. In 2011, Baker self-recorded Underground, with top-shelf generational contemporaries: trumpeter Jeremy Pelt, tenor saxophonist Dayna Stephens, bassist Joe Sanders and drummer Greg Hutchinson. He spent the next four years building a solid career, side-manning with, among others, 7-string guitarist Bucky Pizzarelli, and vocalists Tierney Sutton, Judy Collins and Patrizio Buanne, and refining his own repertoire presentation in diverse rooms like Birdland, the Blue Note, Iridium, Kitano, Gin Fizz, Bemelmans, Le Cirque, the Zinc Bar, the Side Door and Scullers Jazz Clubs.